The AGP slot is quite high up on the motherboard and you'll have to remove the videocard when installing system memory, which is a bit inconvenient. For those of you with memory heatsinks on the back of your card, take care when installing the videocard... When using our test Asus Radeon 9800XT, we found that the rear heatspreader would actually come in contact with the memory retention clips. 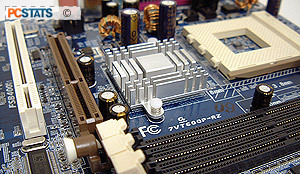 If care wasn't taken when installing the videocard to ensure it is fully seated, it is quite possible to potentially damage a videocard or the motherboard! 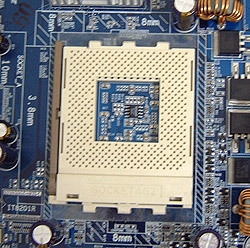 The VIA KT600 northbridge gets quite warm even at stock speeds, but since this is a value-oriented motherboard, Gigabyte have only supplied a passive heatsink. This should be fine for the type of consumer who will be picking up the Gigabyte 7VT600P-RZ, however. There are only a few other things to mention that perhaps could have been done to make the Gigabyte 7VT600P-RZ a bit better - the first is moving the IDE headers a little further away from the last PCI slot, and the second is colour coordinating the front panel I/O connectors. All the new motherboard have headers which show off the polarity of the connector, and it just makes it so much simpler when installing the board.